As you've probably heard by now, well known Hollywood celebrity Scarlett Johansson has been cast to star in a remake of Japanese anime film Ghost In The Shell. Since the announcement, there has already been a surge of backlash on social media surrounding the fact that Johansson, a white woman, is to play the protagonist of the Japanese classic. If you're unaware of why this is problematic, I will break it down. Let me begin with a disclaimer: it is not always problematic for actors to play a character of different origin than their own and we've seen a lot of familiar characters reimagined in great new ways because of this. What is an issue is the Hollywood white-washing of stories that could just as well be told by people of color, which is something we see all too often (most recently, Exodus: Gods and Kings). Practices like these contribute to the erasure of non-white characters in history as well as actors and actresses who are already so largely underrepresented in media, and that does not come without a cost. Many of us who enjoy cinema are conditioned to think of whiteness as the default. As if there weren't already enough roles written for white actors, Hollywood decides that no one could've been a better fit for this Japanese speaking character living in Japan than, you guessed it, a white actress. A bit of a slap in the face to all the Japanese actresses that suddenly became unworthy of the big screen, don't you think? This certainly isn't an isolated incident, and familiar patterns of Asian erasure and underrepresentation are perhaps even more apparent in fashion than in film. In Nov. 2014, Vogue Japan's 15th anniversary issue sparked controversy by choosing Australian model Miranda Kerr to model several Japanese inspired looks and culturally significant themes. Critics rightfully responded with not only claims of cultural appropriation but suggestions of Japanese models who would have been perfect for the shoot, including Devon Aoki and Tao Okamoto. 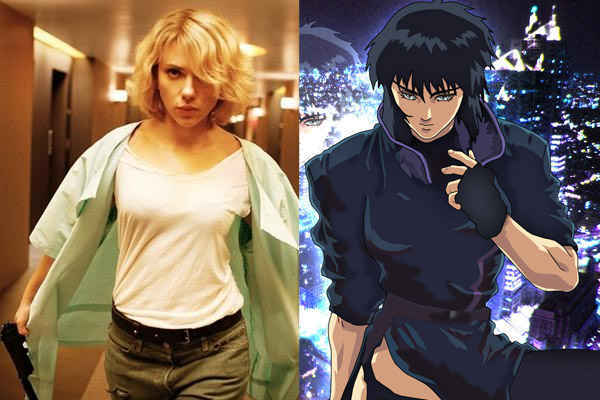 Similarly, among the uproar of discontent for the Ghost In The Shell casting, Japanese actress Rinko Kikuchi's name has come up a lot in response to any and every claim of Johansson being the best choice for the role. A common argument shared by Johansson defenders who are also familiar with the original story is the fact that because the protagonist is technically a cyborg -- making her ethnically irrelevant. However, I consider this argument to be a diversion from the issue at hand of Hollywood's notion that non-white actors just don't sell movies at the same volume as their counterparts. In all honestly, white actors don't need to be promoted any more than they already are. Racial discrimination does not always manifest itself in the form of blatant hatred, often it is neatly packaged in a way that makes it easier for us to accept without much criticism. Ghost In The Shell is an iconic Japanese media franchise and Hollywood's adaptation to live action without honoring the culture which created it is a theme I'd like to see less of. Ghost In The Shell fans and critics of mainstream media alike are losing hope that Hollywood is even able to see the array of talent that lies beyond their white-washed lens.